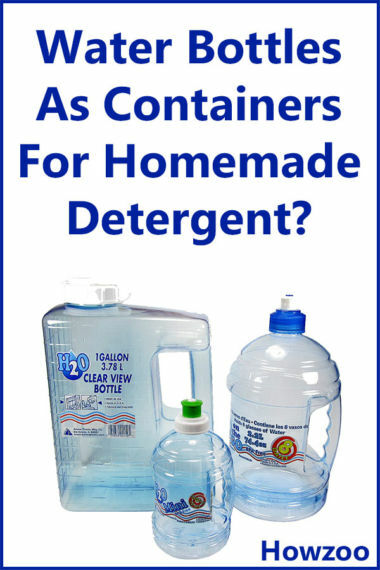 You are here: Home / Cleaning / Water Bottles as Containers for Homemade Detergent? I ran across these bottles in the store the other day and wanted to see if they would work for my DIY cleaners. I bought the 1 gallon, the 74.4oz and a little 18oz bottle. Here is the story….. These bottles are made by Arrow Plastic Manufacturing Co. headquartered in Elk Grove, IL. This companies make a wide range of plastic products and glassware for the home. We are mainly interested in their beverage containers. I have seen these bottles in person at Walmart, Kmart, Dollar General, and Publix. These bottles seem to be very common in my area. I suspect they are available across the US. Feel free to leave a comment about other places you find them. Shown are the 1 gallon refrigerator bottle, the 18 oz H2O Mini, and the the 74.4 oz H2O On The Go. These Arrow Plastic water bottles are widely available in stores. Yeah Yeah, But How Well Do They Work? First of all let me mention the handles. I really like the handles because they are lower down on the side. This provides better balance than what you get with something like a milk jug or a vinegar jug. Second, these things are pretty sturdy. They should last a while as long as the dog doesn’t chew them up ! Now let’s talk about the caps. The cap on the big 1 gallon Clearview Refrigerator Bottle is not watertight. I tried to mix up some detergent in it and it leaks somewhat. But this is not the fault of the container. This is a refrigerator bottle and it is not designed to function as a shaker bottle. I will probably not use this container for detergent. It is a fine water bottle though. The caps on the 18oz H20 Mini and the 74.4oz H20 On The Go bottle are a different story. 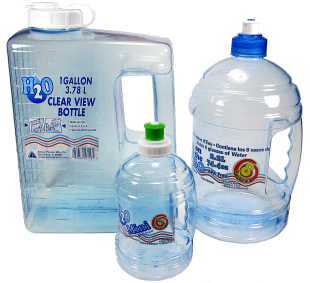 These cap are watertight because these bottles are designed to be portable. You can turn these upside down and they don’t leak. I just unscrew the entire cap to pour detergent out. The sports cap is designed for water and liquid detergent just takes too long for my patience. The sports cap could be useful for dispensing small quantities of a cleaner for spot treatment, however. The cap on the 1 gallon bottle pretty much rules it out as a detergent container in my opinion. In fact, any bottle with that style of cap is probably not going to be your best choice for homemade cleaners. I feel that the 74.4oz(2.2L) bottle makes an excellent homemade laundry detergent bottle. It is well balanced, not too heavy when full, and has a watertight cap. I also like the fact that it is clear and I can see my handiwork. The 74.4oz bottle is my current container of choice. The little 18oz bottle would be great to take to the laundrymat. It would also be good for small-quantity cleaners like DIY eyeglass or lens cleaner. I hope you find this helpful and please feel free to leave a comment or feedback.